You may have noticed things look a bit different around here. That’s because ArtechokeMedia.com went through a complete overhaul! The front and back ends have been thoroughly renovated, reworked and relaunched. To celebrate, we’ve whipped up coupon code RELAUNCH to save you 10% when you spend $30 or more. Head over to the shop to see what we have to offer. Through the My Account page, you can now see the products you’ve purchased, update your personal details, and track your progress through the cloud instructionals (more on that below). We’ve also resolves issues we were having with password recovery. Basically, everything related to how you create, manage and update your account is much simpler now. At the bottom of every cloud instructional page, you’ll now be able to track your progress using the “Mark as Complete” button. 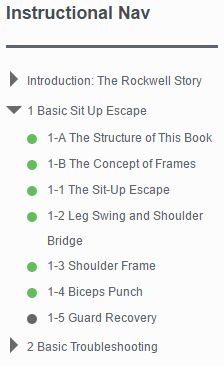 The pages you’ve completed will be marked in the instructional navigation menu. Your overall progress is also shown as a percentage on the My Acccount page. When you return to ArtechokeMedia.com, you can now pick up where you left off by going to the My Account page and hitting “Resume”. This jumps you to the last instructional page you were on. The new shopping cart system brings all of our products under one roof. You can now more easily find (and buy) all of our products without having to dig around different parts of the site. The checkout and account creation is a billion times smoother and easier. The coupon code function is more robust, which means we’ll be offering more deals in the future. The new shopping cart system gives us more flexibility in bundling products, which we plan to use to create lower prices when you buy combos of instructionals and e-books. 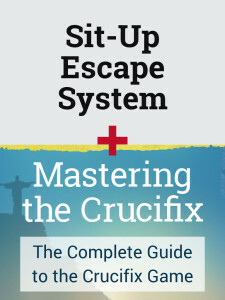 Our first bundle of Mastering the Crucifix + The Sit-Up Escape System saves you 25%. All of our e-books are now in the shopping cart system. Download links for your past purchases (including freebies) are displayed on the My Account page. Our latest release, Training Wheels by Valerie Worthington, is available as a DRM-free digital download thanks to this new system. On the back end, our content creation tools are streamlined and more robust. This means we should be able to more frequently release more cloud instructionals, digital downloads like e-books, and maybe a few new types of products we haven’t even mentioned yet. I started training jiu-jitsu pre-YouTube. If you wanted to learn jiu-jitsu outside of a gym, you had to buy a DVD, a book, a magazine, or read through a blog. This meant that high-quality content was hard to find. You were never quite sure what you would get when you purchased a DVD, and deciphering the unwritten details between photo captions was often a long detective process of trial and error. In those dark ages of jiu-jitsu thought, a few blogs stood as bastions of high-quality, in-depth content. Stephan Kesting’s GrappleArts.com was one of those blogs. In addition to self-producing a number of DVDs that many years on are still relevant and excellent sources of grappling insights, he maintained an active blog where he shared mountains and mountains of technique and strategy. In that time, I’ve had the pleasure of communicating with Stephan on a few projects, and he was gracious enough to lend his support to Matt Kirtley’s Mastering the Crucifix. As the sport has evolved, Stephan has grown as well, and we consider it a huge compliment to have him support us and our work. 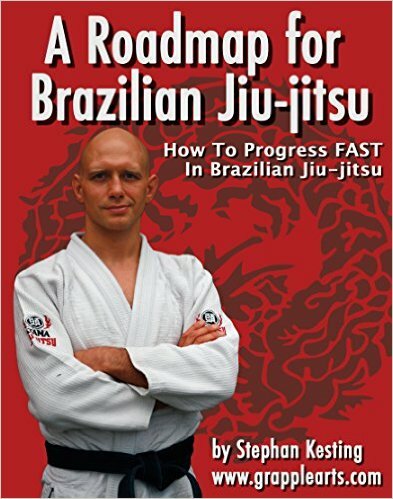 If you are new to the sport—and I meet more and more white belts that have yet to discover Stephan’s material—you can get one of his e-books for free in the next few days. 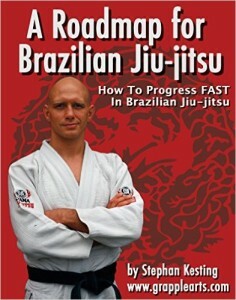 Even if you are an experienced grappler, Stephan’s Roadmap for BJJ will illuminate facets of jiu-jitsu that you haven’t considered. Head over to Amazon and download it for free while you can! Welcome to the pilot episode of the Artechoke podcast. In this episode, we introduce the show concept and riff on jiu-jitsu culture, news, and technique. Sponsor Nick and this show in one swoop! Reach out to artechokemedia@gmail.com to learn more.